Sally's Window of Scraps . : Wednesday!! Hi there friends!! I hope you all had a Blessed Easter!! He is risen!!! Risen indeed!! I had a wonderful Easter. Awesome LifeSong service followed by a family dinner at my niece's house. Here is a picture of my Sweet William with his first Easter basket. I was so excited to give him his basket with his bunny!! I've been knitting for several months now and had so much fun knitting this cute bunny - I just had to make him as his name in the book was Harold... Cute!! For those of you who may not know, Harold is William's middle name, named after my Dad. We really did have a wonderful day, start to finish!! Now, on to share the latest Sketch Challenge happening over at Sweet Sketch Wednesday 2!! We have a new Sponsor Just Some Lines. They have some super adorable images. I chose to use this adorable Bird House - so much fun to work with!! Check out their shop by clicking HERE! 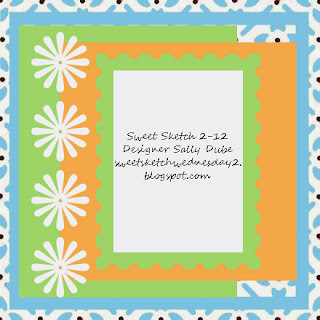 I hope you will head on over to Sweet Sketch Wednesday 2 and check out the rest of the Design Team's creations and then perhaps play along!! I just love to see everyone's take on the Sketch!! Your bunny is gorgeous Sally and William looks to have grown so much. Oh Sally both little bunnies are totally gorgeous I do hope William and family had a lovely Easter holiday. Love your sweet card, this is a wonderful image I wish I had chosen it myself perfect for a birthday or house warming card. Love your colours and embellishments. Take care and have a great week. Gosh William has grown! Love the picture of the bunny too! Your card is wonderful this week. I love it's warm and happy feeling. Glad your Easter was so great! William looks so sweet in his little sweater vest! 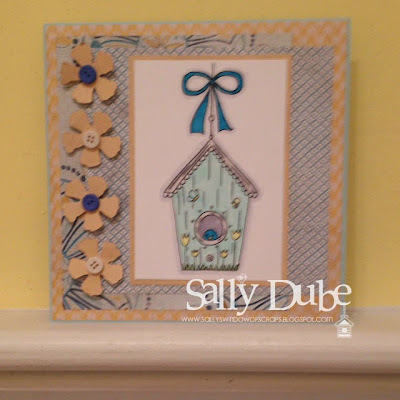 Your card is super cute, love the little bird house and your color combo.